Artists In Residence Give High-Tech Projects A Human Touch : All Tech Considered A 3-D printing software company hands artists high-tech tools to craft human-centered projects. But it isn't the first program to pair the imaginative with the practical to inform great innovation. 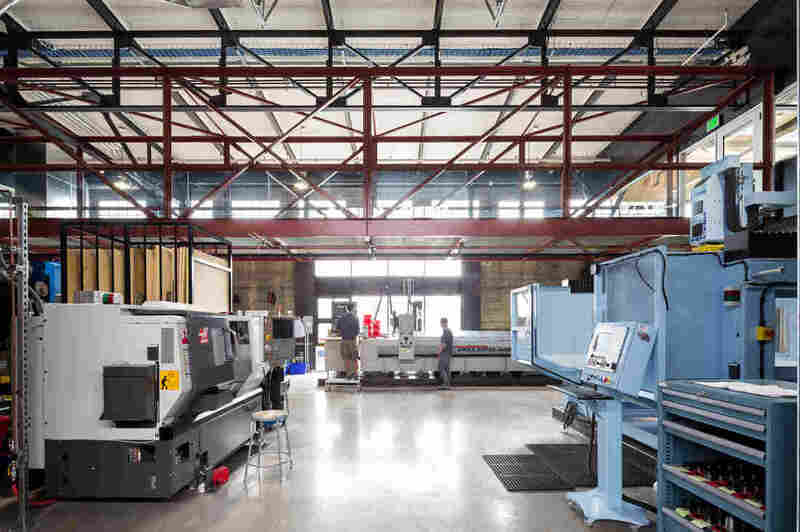 Artists in the residency program at Autodesk are given access to production-quality equipment in workshops, allowing them space to create at-will. You may want your kid to major in something practical at college, like engineering, so they can land one of those great jobs at a big tech company. But, you might also urge them to spend time studying the arts. Some tech companies are bringing in artists to help them work out ideas and build cool new things. A few companies have actually set up artist-in-residence programs over the last two decades. Right now one of the most prominent program is at Autodesk, a company that makes software for 3-D printers, manufacturing plants, construction sites and architects. Autodesk has a huge, airy office and work space on Pier 9 in San Francisco, with big windows overlooking the bay. The workspace has high-end 3-D printers so accurate they can print details the size of a quarter of a hair strand. The lab also has a woodworking, electronics and metal working shops, and an industrial sewing center. It has a saw that can cut through steel, glass and even stone using only a stream of high pressure water. And since San Francisco is foodie heaven, it even has a test kitchen. Noah Weinstein, senior creative programs manager, came up with the idea to open up the workshops to artists. "This is a new vocabulary of software and a new vocabulary of using these tools for creative output," Weinstein says. "I think that the artist is a great explorer to ask those questions about what should these tools be doing, what do they do best and what's not working?" Twice a year, Autodesk admits 16 artists to its four-month residency program. They each get full access to the workshops and a stipend. Often the people who apply have backgrounds in both technology and the arts. "There's been these two parts of my brain," says Scott Kildall, a sculptor who has an MFA in art & technology studies. "I've been wanting to combine code with sculpture for so many years and wanting to do digital fabrication of taking the code and generating the objects." One of Scott Kildall's Water Works projects, called San Francisco Cisterns, maps the 170 underground cisterns of San Francisco. And he's done that at Autodesk. There, he's uncovered all kinds of data about San Francisco's water systems. Among his discoveries was that there are cisterns below the streets that were installed shortly after San Francisco's devastating 1906 earthquake. Kildall used the 3-D printers to create a sculpture of this underground system — it's small enough to wrap your arms around. The cisterns look like ivory-colored votive candles connected by a system of translucent pipes. And it's all in the shape of San Francisco's famous hills. It almost looks like the ship on the sci-fi series Battlestar Galactica. "I would say they look kind of organic alien," Kildall says. "There's an organic structure to them because they follow the topography of San Francisco so they have these natural curves and boundaries." And just as Autodesk hoped, Kildall's project put the company's 3-D printing software to the test by overloading it with data. 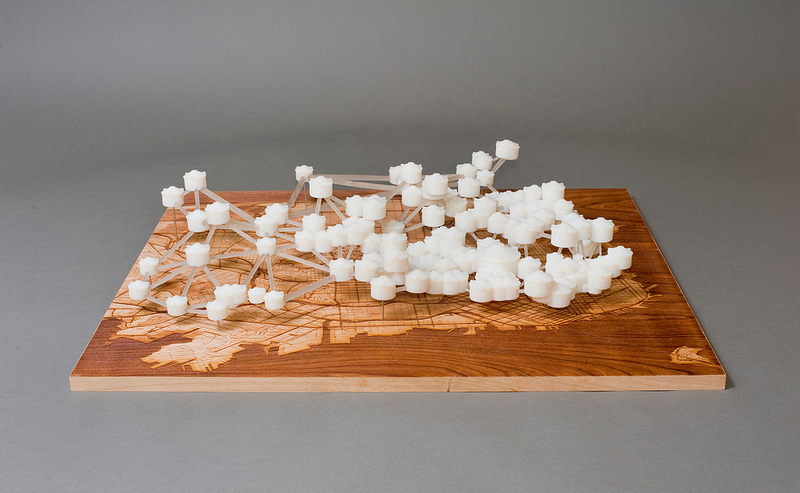 "Each of these models took about 40 to 50 hours to print," he says. The nice part of the residency is that he could work with the engineers to overcome the challenges. They learned, and so did he. Another artist in residence, Laura Devendorf, was also challenged by the 3-D printers. "My adviser and I were trying to think of a way to do 3-D printing with everyday materials," she says. "Maybe grabbing sticks or leaves and actually making these 3-D objects out of them." Three-dimensional printers work by using an extruder that layers up melted material until it creates a solid object. Devendorf realized that it wasn't going to work with sticks. There was something missing from the process — humans. Devendorf configured the printer to use a laser light to show humans how to do the layering. "I'm actually asking people to perform manually the functions that 3-D printers do," she says. It's an odd exercise, but one which Devendorf says is meant to raise questions about the role of machine versus human labor. Autodesk's isn't the only artist-in-residence program in the tech world. Facebook has a program, and there's a history of such collaboration in tech companies. The late Steve Jobs famously said, "I think part of what made the Macintosh great was that the people working on it were musicians and poets and artists and zoologists and historians who also happened to be the best computer scientists in the world." Xerox PARC, where Jobs first saw the computer mouse and the graphical user interface, had an artist in residence program. John Seely Brown, who ran PARC for 20 years, says we're in a time where technology is providing us with infinite possibilities. "The ability to imagine is the key challenge," Brown says, "because we have infinitely powerful tools to build whatever we imagine. As a result we're limited by our imagination. Working with artists really opens our imagination." Brown believes that if we want technology that solves big problems in elegant, human-centered ways we need artists to be part of the process.